Mrs. Adler and her late husband, Mike, co-founded Myron Manufacturing over 60 years ago. It is a mail order firm specializing in marketing products to businesses. After Mike suffered a stroke in 1993, the Adlers founded the Adler Aphasia Center in Maywood in 2003 and have been honored nationally for their work in helping individuals with the disorder. To date, Mrs. Adler has started 3 full service Centers for people with APHASIA and their families hoping to open one in Florida in the near future. They are in Maywood, N.J.; West Orange N.J.; and Jerusalem, Israel. Ms. Adler is a trustee of the Arnold P. Gold Foundation, the Center for Interreligious Understanding and is a founding board member of Gilda’s Club of Northern N.J. She is a member of the advisory board of the MarshAccess program at the Meadowlands Environment Center, which serves adults with disabilities. 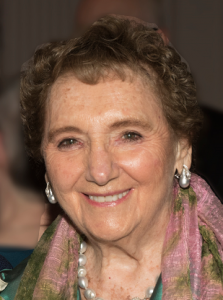 Ms. Adler also serves on the boards of the Community Resource Council, the USA Toy Library Association and the Jewish Home and Rehabilitation Center in Rockleigh. The Adlers have received numerous awards. The Association of Fundraising Professionals (AFP) N.J. Chapter honored them in 2015 as “Philanthropists of the Year.” The Adlers were named Distinguished Citizens in 1992 and awarded honorary degrees in 1999. She currently serves on the Ramapo College Board of Governors. In November 2010, the Adlers made a generous gift to create the Adler Center for Nursing Excellence. The Adler Center is the new home of Ramapo College’s highly acclaimed and expanding Nursing programs, as well as state-of-the-art labs to enhance the education of Ramapo College students in the sciences. Ms. Adler holds a degree from New York University.